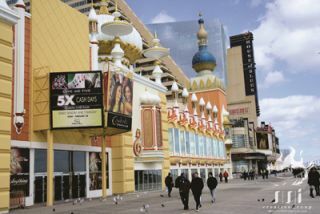 The Taj Mahal in Atlantic City, a Trump Entertainment Resort, welcomed its newest form of marketing entertainment to the Atlantic City Boardwalk with a new LED video display system from Daktronics and SSI Creative Group. Trump Taj Mahal's new 10 mm LED video display measures approximately 12-feet high by 11-feet wide and features a fully sealed cabinet design to ensure it performs reliably in its coastal environment. Built for high performance, all Daktronics outdoor LED video displays have multiple layers of outdoor defense, including protection against extreme cold, heat, corrosive salt, and precipitation. Brad Wiemann, vice president of commercial and transportation business for Daktronics, said, "When the SSI Creative Group selected us to customize a video display system for the Taj Mahal property in Atlantic City, we suggested this display to complement the property. This product offers advanced weather defense solutions and crisp image views at close distances."